Honestly, I have no resolution for 2018. All that I want is for everyone to be happy and healthy. So as usual, I will run, cook and bake like crazy. Plus, I will be sharing many good recipes at my blog, Facebook at here and here and my Instagram @zoebakeforhappykids so that we all can eat well and be happy for our 2018!!! Hence, my first blog post for 2018 is to share a chocolate chip cookies recipe that is potentially healthy! Healthy cookies baked with butter, sugar and chocolate? NO WAY!!! Despite the fact that the butter-and-sugar loaded chocolate chip cookies are obviously NOT healthy, I always ask myself... Can I bake these classic treats a little "healthier"? Healthy chocolate chips cookies? I know... Even my fat thighs are laughing! LOL! Seriously... If you do a Google for "chocolate chip cookies clean eating" or "healthy chocolate chip cookies", you will find many recipes!!! And they are mostly recipes that uses wholemeal flour or almond meal or oat flour instead of white flour. And also, recipes that substitute butter and sugar with coconut oil and raw sugar or coconut sugar. Are these so-called healthy chocolate chip cookies really healthy? Not really! Nutritionally, these cookies are high in their fat and sugar contents too. Pardon me for being very blunt and honest... To me, these so-called healthy clean eating cookies recipes are pretty rubbish!!! ... but can you imagine eating cookies without any fat and sugar? Ewww... They must be so bland like cardboard! Then, I would rather not bake or eat any healthy cookies!!! LOL! Ok. I have learned to accept the fact that all decent-tasting cookies need to contain fat and sugar and I reckon that the only way to bake the cookies a little healthier is to use less butter and less sugar. If you are thinking of using healthy ingredients to bake healthy cookies, I suggest you should NOT use the idea of using coconut oil or margarine as butter substitute or raw / unrefined sugar or coconut sugar as white sugar substitute. These ingredients might make your cookies taste a little better, maybe with some extra minerals and vitamins but won't make your cookies less sweet, less fat, lower in calories or any healthier!!! So, NO saturated-fat loaded coconut oil or trans-fat loaded margarine, please!!! However, if you really have to use coconut oil and margarine for its unique taste and texture and also for your vegan dairy-free baking, please use them... and moderately! Instead, I think you should use healthy additions like ingredients with dietary fibers, good fatty acids, protein, vitamins and minerals. Ingredients like wholemeal flour, almond meal, oats, chia seeds, flaxseeds and etc. These additions in moderate amounts won't comprise the delicious taste of most chocolate chip cookies. So, no harm trying! This is why I have been baking different chocolate chips cookies with oats at here, here and here. Accordingly to Wikipedia, flaxseed (also known as Linseed) contains high levels of protein, dietary fiber, several B vitamins, and dietary minerals like thiamine, magnesium and phosphorus. It is known that flaxseed can reduces total and LDL-cholesterol in the blood and is commonly consumed as health food. Can I detect the added flaxseed meal in these cookies? In these yummy cake-like cookies with crispy rims, I can taste the flaxseed very subtly as very tiny nutty bits. My son can't detect this addition at all and said that the cookies are delicious and enjoyed eating them as his school treats. Can we detect any flaxseed in these cookies? 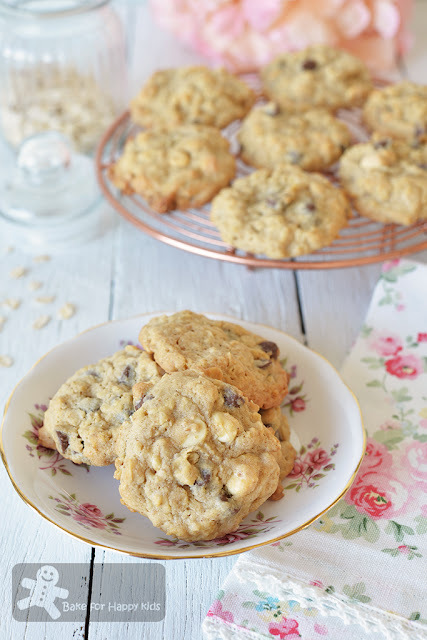 These cookies are delicious with cake-like texture and crispy rims when they are freshly baked. Yeah... No harm baking these!!! LOL! It's so easy! Here's a video showing how I baked these cookies. I'm not going to lie... Absolutely NO WAY!!! 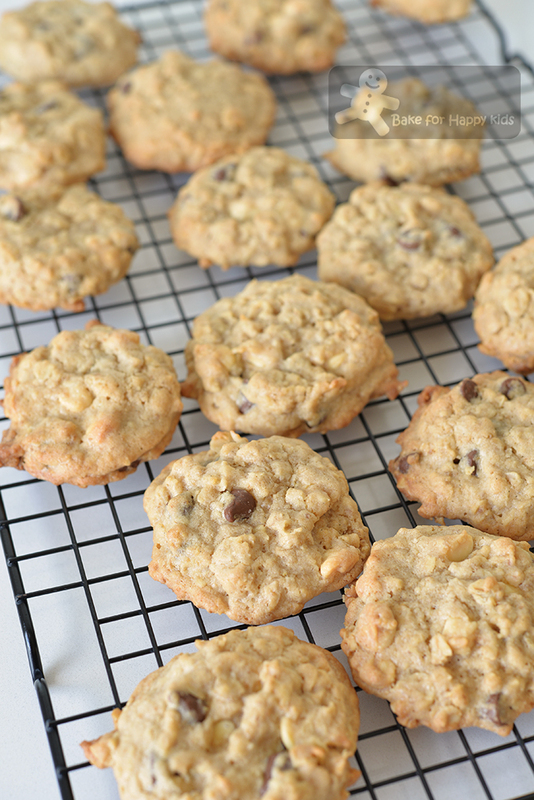 Can oat and flaxseed make chocolate chip cookies healthier? NO! ... but it can make the cookies that are more nutritional beneficial to enjoy! Having said that, I strongly suggest not to go crazy loading your cookies with oats and flaxseed meal. Or don't stop using butter and sugar to bake your cookies. No cardboard cookies, please! Moderation is good and please try this recipe! Due to the LESS sugar LESS butter contents, these cookies are cake-like with crispy rims only when they are freshly baked. 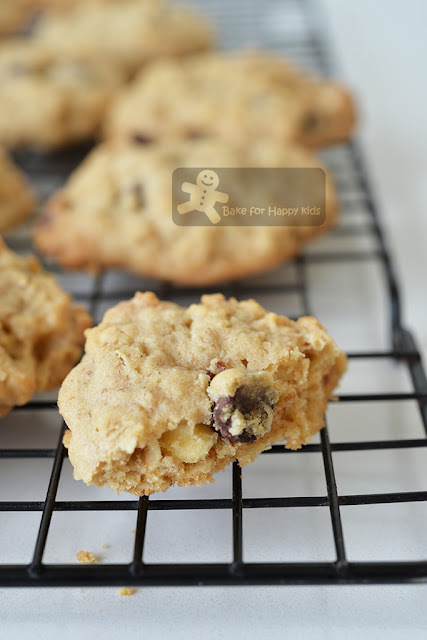 If you prefer oatmeal chocolate chip cookies are that crispy or chewy, please try these recipes at here and here with more added butter and sugar. 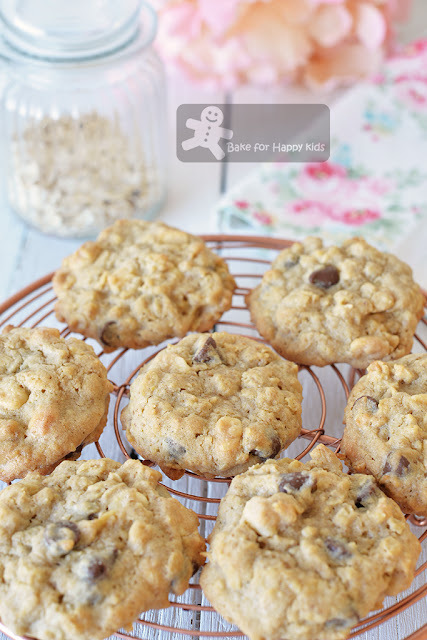 Here's the LESS fat and sugar Oatmeal Flaxseed Chocolate Chip Cookies recipe that is very modified from Food Network. IMPORTANT: These cookies are not sweet so please do not reduce the sugar further. If you are afraid that the cookies are too sweet for you, you can use 1) dark chocolate chips with reduced amount of sweetness instead of white or milk chocolate chips or 2) add nuts into your cookies. 20g (2 tbsp) finely ground flaxseed (flaxseed meal / linseed meal) - can be substituted with almond meal, hazelnut meal or oat flour or simply more oats. 90g (about 1/2 cup) chocolate chips - I used a mixture of dark and white chocolate chips. Using a wooden spoon or an electric mixer with paddle attachment, beat butter, caster sugar and brown sugar until combined and fluffy, about 2-3 mins. Add egg into the butter mixture bit by bit, beating well after each addition. Then, beat in vanilla. Combine flour, baking powder and salt and sift flour mixture into the butter mixture. Add oats and flaxseed meal and use a spoon or spatula to mix until all ingredients are well incorporated. Then, stir in the chocolate chips and nuts (optional). Drop tablespoonfuls of dough onto the prepared baking sheets, about 5 cm / 2 inches apart. Use the back of a metal spoon to flatten the dough slightly and bake until golden brown, 12-13 mins or until the edges of the cookies are firm. Allow cookies to cool slightly on the tray for 5-10 mins, then transfer to racks to cool completely.